The Victoria & Alfred Waterfront (V&A Waterfront) in Cape Town, South Africa, is one of the most visited tourist spots in Africa and attracts about 20 million visitors per year. The historical complex consisting of two harbor basins and surrounding buildings is a mixed-use area with a focus on retail, tourism and residential development, with the continued operation of a working harbour. And it has now gone solar. Eight of its redeveloped historical buildings are covered with 4 200 solar panels. The photovoltaic system with a Sunny Tripower solution from SMA has an overall output of 1093.8 kWp. The daily output of 4 495 kWh of clean solar power is enough to cover up to 35% of the electricity demand of the eight buildings. The V&A Waterfront – one of the top three consumers of water and electricity in Cape Town – will substantially enhance its independence from electrical utilities. 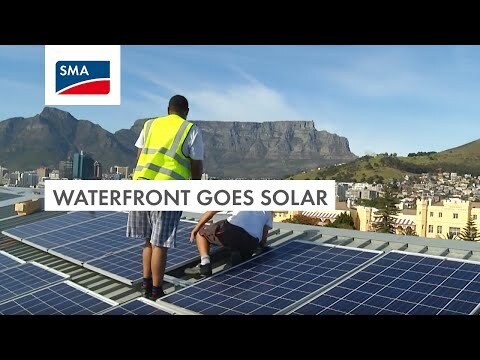 Inauguration of the solar installation at the V & A Waterfront: Gregor Küpper (SolarWorld SA), Colin Devenish (V&A Waterfront), Alan Winde (Minister of Economic Opportunities of Western Cape), Axel Scholle (Sustainable Power Solutions), Thorsten Ronge (SMA SA), Bernhard Suchland (Schletter SA).